In his book Claretta: Mussolini’s Last Lover R. J. B. Bosworth relies in large part upon Claretta’s extensive diaries and journals to ferret out the details of the often-contentious relationship between these two people. While these chapters may take away from the main character of the book, their necessity becomes obvious as the story unfolds to reflect upon the many jealous tirades cast forth by Claretta each time “Ben” returns to any one of these other women. The depth of Claretta’s character is also developed through the information Bosworth trolled about her family. This is as much a story of Claretta’s social-climbing and demanding family as it is the story of her relationship with il Duce. In fact, it was this relationship that fostered those very same demands. 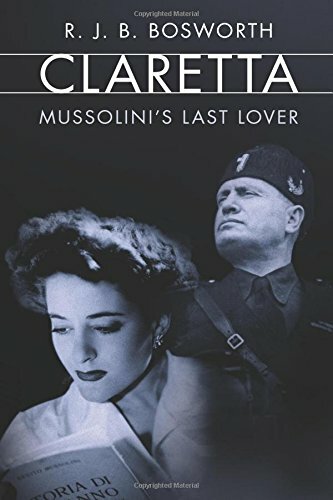 Claretta did not gain favor with Mussolini’s family and other lovers, but she also did not gain favor with his political adversaries. As the storm clouds rolled over the Italian political network, Bosworth gives clear description to the effects of Mussolini’s failed attempts at leadership. Claretta doesn’t always fare much better. Her demands often paint her as a bit of a harpy, demanding a position in his life that she does not deserve. In fairness, it can be said that most of the women in his life made demands that could not and would not be met. Bosworth relates the results of the July 24, 1943, coup against Mussolini and focuses on how Claretta (and her family) spent time in prison. Ever the journalist, Claretta detailed imagined conversations with el Duce as she expressed the trials of prison life. The new regime lasted only 45 days, when Mussolini was “rescued by a SS glider team and delivered to a reunion with his legitimate family near Munich.” By October of that year, Mussolini was reinstated as leader, and his relationship with Claretta resumed. As the war progressed to its finality, Bosworth points out that the telling of Claretta Pitacci and Benito Mussolini’s deaths comes in a variety of versions, but all having the same ending. On April 28, 1945, Claretta and Benito were executed. Their bodies were subsequently removed to Milan where they were hung, upside down, to prove to the public that they were, indeed, dead. Claretta: Mussolini’s Last Lover is a book that casts a new light on Mussolini as a failed leader. For readers interested in World War II and the path upon which its leaders trod, this is informative and interesting.